smitRem is a stand-alone tool designed to remove some widely spread parasites from the compromised computer. 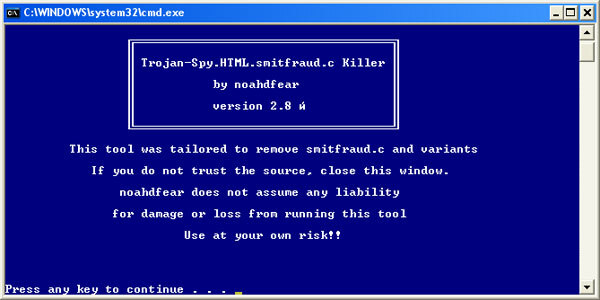 smitRem detects and removes numerous variants of the Smitfraud trojan and its infamous derivatives including SpySheriff, SpyAxe, SpywareStrike, PSGuard, WinHound and a number of others. 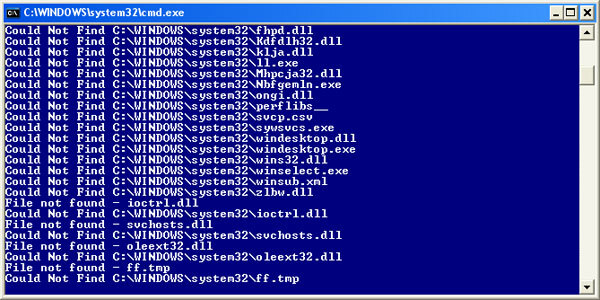 The tool also eliminates the Bloodhound.W32.EP parasite infecting essential Windows system files. More information about the tool can be found in our smitRem review. The following guide thoroughly explains how to use smitRem in order to get rid of some widely spread trojans, malware parasites and corrupt anti-spyware programs. First of all, you have to get the tool. smitRem is absolutely free to download. You can obtain it from the official web site. Current package size is only 179KB, so the download should not take more than a few seconds. Now you can install the tool. smitRem arrives in a self-extracting archive, so the setup is really easy. Double-click on the downloaded executable file to start the setup. You will be presented with an archive extraction window. Select the folder where you want smitRem files to be extracted to. Then click on the Start button (on Image 1 it is designated by the blue box) and wait until files will be successfully extracted. Now the setup is finished. smitRem should be used in Windows Safe Mode. This ensures that all malicious files this tool removes will be detected and deleted properly. Reboot your system into Safe Mode (read the Starting the system in Safe Mode tutorial to learn more). Once Windows is in Safe Mode, you can launch smitRem. Open the folder where the tool’s files were extracted to during the installation. In my case it is C:\Program Files\smitRem. Now double-click on the RunThis.bat file. This will start smitRem. You should see a window similar to that shown on Image 2. Once the RunThis.bat is executed, you can start using smitRem. Press any key to leave the introduction screen and continue. 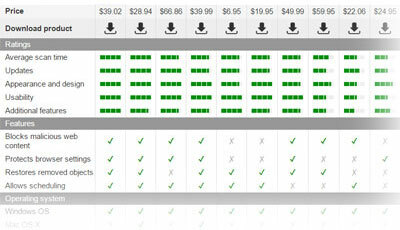 You will be presented with another screen similar to that shown on Image 3. Press any key to continue. 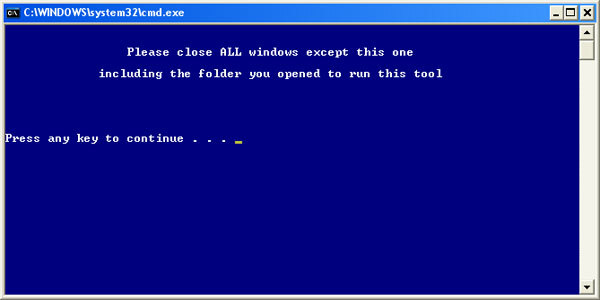 Now the tool will ask you to close all opened windows except for its own. Press any key to continue. Another screen should appear. Pressing any key there will allow smitRem to search for some corrupt anti-spyware programs like SpyAxe or SpywareStrike and uninstall them. 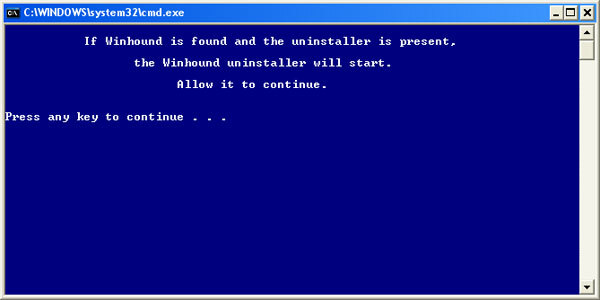 Now you will see a screen asking you to press any key in order to allow smitRem to search for WinHound, another corrupt anti-spyware product and uninstall it. Now smitRem should begin searching for and removing malicious files from your system. 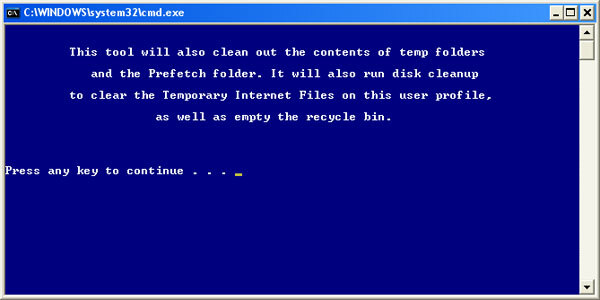 The tool will terminate the Explorer process, so your desktop and taskbar will disappear for the time being. Your desktop background will be changed. However, there is nothing to worry about, as smitRem will not modify any system settings. Press any key to continue. This will start the removal process. During this process you will see lines running across the smitRem’s window. These lines list objects that the tool checks for and removes. This may a take a few minutes. Please note that smitRem will not provide any report about removed objects and uninstalled programs. After the removal is over, smitRem will launch the Disk Cleanup utility, which is a standard Windows tool used to erase temporary files, program cache and other unused objects. Although the full cleanup may take quite a long time, it is a generally good idea to let it finish. 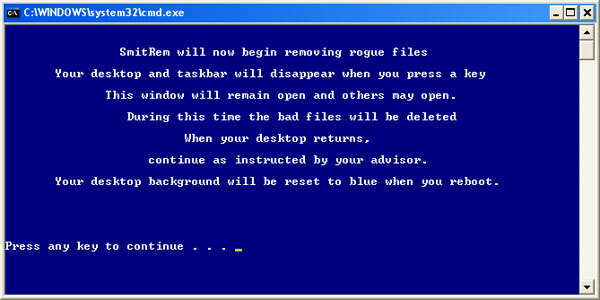 This may remove hidden malware installers and parasite update modules. smitRem is very effective in removing widely spread parasites. 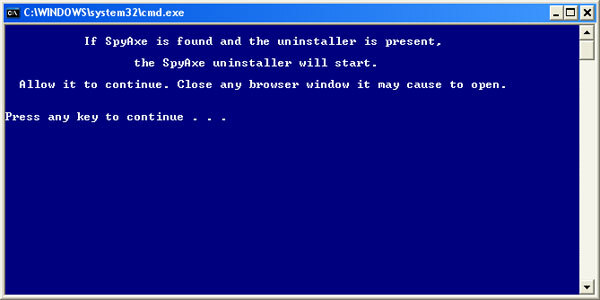 However, it is not a full-scale spyware remover. It is a stand-alone tool that removes only several known threats and therefore cannot replace powerful anti-spyware software. If you need an advanced spyware remover, please take a look on the list of our recommended anti-spyware products. This entry was posted on 2006-02-22 at 09:07 and is filed under Articles, Tutorials.